OSCE-EU – A relationship that needs to be fine-tuned. 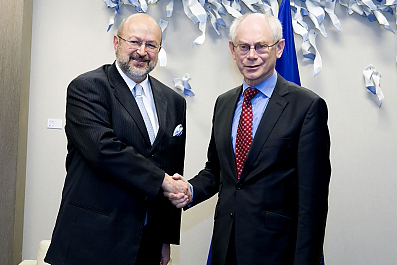 The current challenging political and economic environment calls for focused international response, said OSCE Secretary General Lamberto Zannier and President of the European Council Herman Van Rompuy during their meeting on 10 April 2013. According to the web portal osce.org they discussed a wide range of issues related to the European security dialogue, including the role the OSCE can play as a forum to build bridges between different countries to create a Euro-Atlantic and Eurasian security community. They also exchanged views on regional issues on the OSCE agenda including recent developments related to the protracted conflicts. In Brussels the Secretary General also met with Commissioner Štefan Füle responsible for enlargement and European neighbourhood policy and senior officials from the European External Action Service.